Synthetic fabrics shed micro plastic into our washing machine and out into our water sources every time they are washed. These seemingly harmless little specks of plastic are a huge threat to our environment and to the people on it. Despite that, companies continue to use more and more synthetic fabrics because they are trying to keep up with the pull of fast fashion. 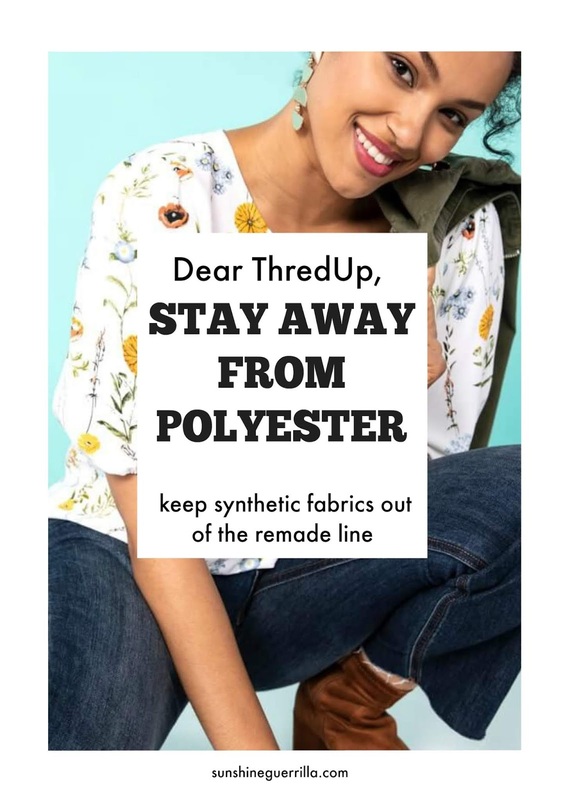 We at Sunshine Guerrilla are ready to speak up and call out companies that haven't stepped away from these toxic fabrics yet. 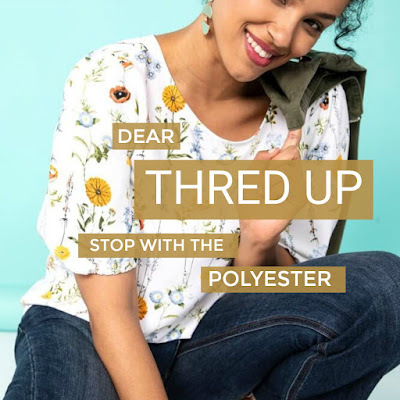 No more polyester. Let's do this. 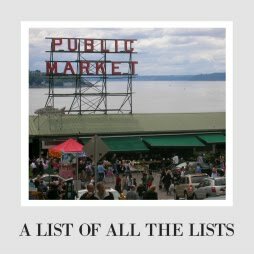 I am obsessed with your store. My sons’ and my wardrobes are now about 90% secondhand, and so much of that is thanks to you. When I can’t track something down locally, I can usually find it on your site. I recommend you constantly to everyone. 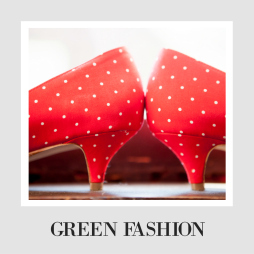 I switched to secondhand clothes for environmental reasons- shopping your secondhand site means fewer clothes are going in a landfill and we don’t have to support the often unethical manufacturing of clothing. Plus, our boxes of clothes come wrapped in paper instead of plastic! You have made it easier for everyone to save money, do the right thing, and shop secondhand. Truly, my love for your site could not be deeper, and I totally believe in your vision of a circular fashion economy. That said, I have a bone to pick with you. When you announced that you were making your own clothing line, I was so excited! I loved the concept and when I first saw the prints for the shirts and dresses I thought they were just gorgeous. Then I looked closer, and my heart broke a little. About half of the clothing in your new Remade line is made of plastic-based synthetic fibers. Remade, in theory, is such a genius idea; you stuck to staples, not trendy pieces, with long lives ahead of them. You also have a buyback promise, so when people are done with the clothes, you will actually buy them back. I love it! But here's the thing. Every time you wash a plastic-based synthetic fabric (like the polyester and elastene in your clothes), the fabric sheds tiny plastic microfibers into our water sources. As the fabric gets older and looser, it sheds more and more plastic pieces each wash. These microscopic pieces of plastic are a very, very big deal. We know that these plastic pieces are one of the biggest threats to our environment and to our existence. This plastic in the oceans outnumbers the start in the sky, and as of now, it is impossible to clean up. Scientists now find tiny microplastics from clothes in every recordable corner of the oceans. Every water source. Most salt. Even in human feces. But what can a tiny piece of plastic even do? The truth is we don't even know the full extent of the harm these tiny shreds of poison are doing. We know that plastic is linked with hormonal changes, endocrine problems, and cancer. We know what some of the plastic chemicals do (cancer), but so much is still unexplained. What we do know is that plastic is poison. If you knew the clothes you were selling was blasting asbestos into people's water, would you do it? Of course not! You guys at Thred Up are way to awesome for that! But history will see this the same way. You show amazing concern for the environment all over your site (moreso than basically ANY other online store I can think of), I could not believe you would send even one extra piece of plastic out into the environment. Please stop this trend. 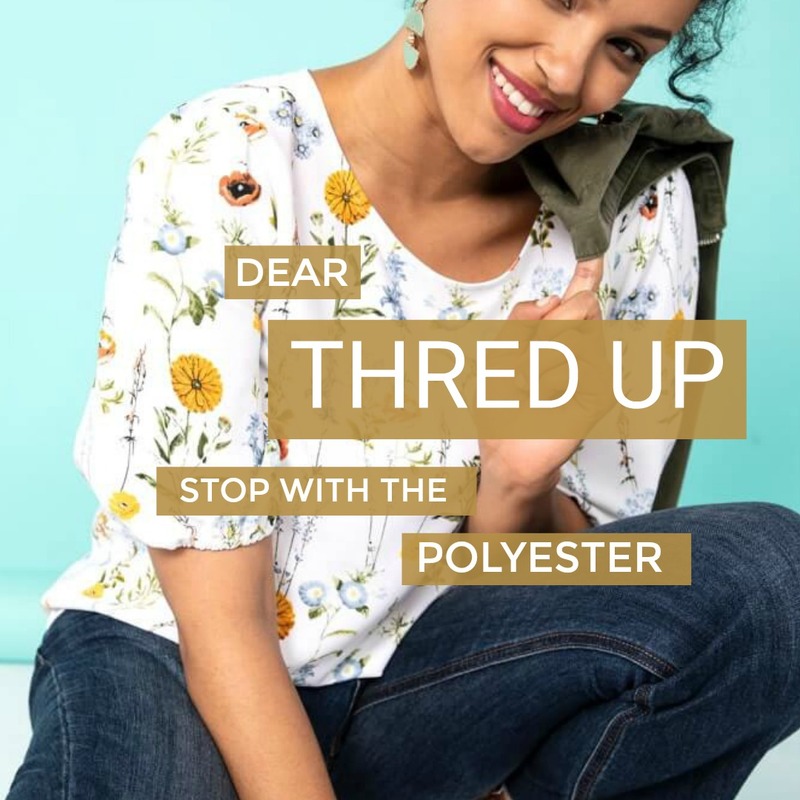 If you want to do more to STOP plastic microfibers and synthetic fabrics, why not add a reminder on all the secondhand clothes that all synthetic fabrics shed plastic. Thhis could help people become more aware of the problem and be more mindful of what they are buying. Please stop selling plastic clothes. You are too good for this.